Finally it’s over. 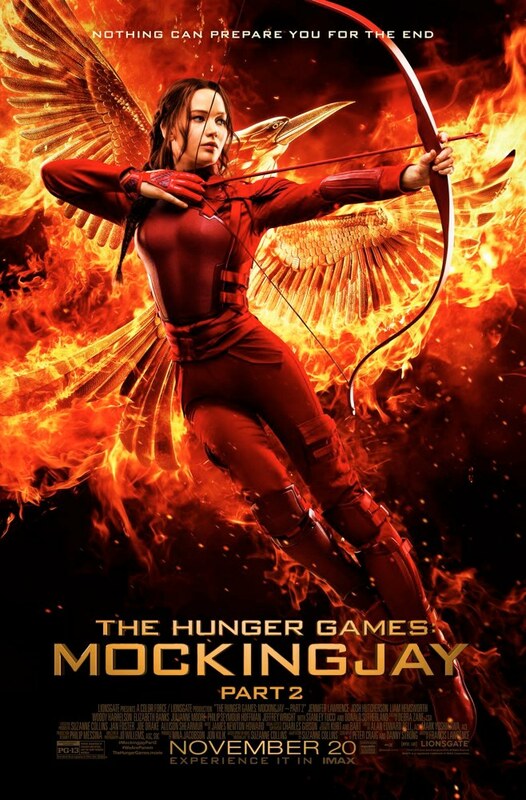 The Hunger Games franchise comes to an end with The Hunger Games: Mockingjay Part 2 where Katniss and the rest of her band of rebels take the fight to the Capitol to change the world once and for all. Some of you may remember my review of The Hunger Games: Mockingjay Part 1 from last year where I mentioned that I was less than impressed with the films both as adaptations of the books and as films in their own right. For this outing I had held out some hope that all of the posturing was out of the way in the pointless first outing to make this one a worthwhile and enjoyable experience by comparison. Sadly it doesn’t manage to do that with an obscenely bloated running time for what amounts to half a film and too much time spent meandering around with no real purpose. It takes a good hour before anything interesting happens and by then the film had pretty much lost me. Characters would discuss aspects of the War that were going on elsewhere -or in one case the background- but it largely feels like an event that is happening so far away that it isn’t important. I’m all for putting the characters in the middle of everything but I would actually like them to be in the middle of everything for that to work. When the film does finally get around to delivering some action sequences they are competently executed with a notable highlight being a genuinely tense engagement in the sewers. The sea of oil was a cool sequence as well but beyond that there’s really nothing memorable going on in that department. As I mentioned above things are talked about but never shown making the conflict feel too large in scope for the characters to have any bearing on it. Thematically there’s some interesting things going on here. The Hunger Games serves as a cautionary tale about the potential dangers of government and how the proliferation of advertising as well as social media can be harmful to society when the wrong messages are delivered. This is picked up here as more mention is made of fighting using propaganda involving the Mockingjay to rally the troops as well as the citizens to the cause of the rebels. Nothing new is done with it but it has been a consistent theme throughout the films that has always been handled reasonable well. There is an extension to the theme when the rebels are suggested to be just as bad as those who they are fighting against. Their leader President Alma Coin (Julianne Moore) is a character that the audience is encouraged to be suspicious of as some of her speeches don’t sound as if they are championing freedom in the way that people expect. I wish the film had made more of this considering it had the time to do so but what it does show is pretty well handled. Julianne Moore’s performance as someone with her own agenda works really well. Jennifer Lawrence was propelled to instant stardom with this franchise and it’s easy to see why. Even though Katniss isn’t always the most well written character, Lawrence brings a sense of strength and morality to her that sometimes isn’t present in the script. She is very much a passive observer to much of the events by design as the idea of the Mockingjay is more important than the actual person associated with it as far as the masses are concerned. It’s a good idea but it somewhat limits her effect on the story by making her an indirect part of the action. The other characters aren’t really featured heavily aside from Josh Hutcherson’s Peeta who goes through a difficult process of breaking the brainwashing caused by the Capitol. In a lot of ways he has the most defined arc of the film as he progresses from murderous hatred and rage to being calm and finding himself again. It’s a solid progression that works really well but his relationship with Katniss as established over the previous films isn’t concluded as well as it could. Liam Hemsworth’s Gale is probably in it about as much as the other films and fails to impress while he is on screen. It feels like he’s only around to make up the numbers without having any noticeable impact on the overall story. There’s a real disconnect that makes him feel less like Katniss’ best friend and more like some soldier she sort of knows. Impressively the film manages to make some use of Philip Seymour Hoffman thanks to many of his scenes being filmed years ago and the rest being done by doubles and CGI. As a result of his passing he can’t have the impact on the story that he should but that can’t really be helped. It’s good that he manages to be in it at all but it’s hardly a great note to end a career on. Donald Sutherland’s President Snow is a pretty ineffectual presence simply because he’s not in it all that much. He has a few scenes where he tries to intimidate through mandatory public announcements but he never feels like the evil mastermind that must be toppled. It would be fine if there was some nuance to his character but there really isn’t. The ending of the film is far too drawn out with far too many scenes designed to wrap things up to the point that they simply feel tedious. It all fails to resonate as something meaningful but that’s more due to the poorly constructed storytelling before this point. Many of this film’s failings can be attributed to the book as that isn’t a very good example of the conclusion of the story either but a lot of the problems sit with the film itself. Visually it’s too dark and unpleasant to look at with some dodgy effects to boot and the command of pacing is almost non existent. I am pretty glad that this adaptation is over it has to be said. An underwhelming end to a poorly constructed franchise based on The Hunger Games series of books. The running time is obscenely bloated for what amounts to half a film and despite much of the posturing being done in the pointless first outing this film fails to pick up any sense of pacing as it progresses. It takes far too long for anything to happen and it had lost me by the time it did. When the film does get around to delivering some action it is competently executed. A tense sequence in a sewer and a river of oil serve as notable highlights but there isn’t much else to really speak of that sticks in the mind. Much of the interesting action seems to be happening elsewhere as the characters talk about it without it directly impacting the story. Thematically there are interesting things going on as the cautionary tale about the role of government and the media on the way people think is still in the middle of everything. It is expanded on by the suggestion that the rebels might be just as bad as the people they are trying to stop. Julianne Moore’s President Coin is a great example of that with a lack of sincerity to her speeches about freedom. Jennifer Lawrence is excellent in this film and elevates a lot of the substandard material she has to work with. She gives Katniss a sense of strength and morality that often isn’t present in the script. She spends a lot of the film being a passive observer to events since the idea of the Mockingjay is more important than the physical presence. It’s a good idea but limits Katniss as a character. Josh Hutcherson’s Peeta has the best arc in the film as he goes from being brainwashed to regaining his humanity in a way that feels organic. The conclusion to his relationship with Katniss doesn’t work as well as it should but his part in the film was reasonably strong. Liam Hemsworth’s Gale seems to only be around to make up the numbers with very little agency of his own within the story. His relationship with Katniss isn’t given the conclusion it really needs to. Impressively Philip Seymour Hoffman manages to be in the film but his character isn’t as significant as he should be. It can’t be helped since Hoffman sadly passed away but his inclusion sometimes feels clumsy. Donald Sutherland is a really ineffectual villain who never comes across as the evil that needs to be toppled. This would be fine if there was any nuance to him but there sadly isn’t. Much of his contribution to the plot involves him saying threatening things over mandatory public announcements. The ending is incredibly long and drawn out to a frustrating degree. None of it manages to be meaningful but it never could be due to the poorly constructed storytelling before this point. Many of the failings of this film can be attributed to the book. It’s far from a suitable climax to the story but the film makes just as many missteps. It’s unappealing to look at with dark and gloomy visuals and there is no command of pacing to speak of. It’s a franchise that I am glad to be rid of.